Now that plans for a “new year, new you” are under way (or out of the way), let’s focus on the fun stuff…the hottest home design trends of 2016. It’s an exciting year to be sure, and we don’t plan to miss a minute of it. Unquestionably, there’s more to swoon and salivate over than we can cover in one blog topic, so we’ve handpicked our favorite looks that can be achieved without a big splurge. If you’re on a bit of a budget but still want to keep your style up-to-the-minute and have fun re-imagining your space, this list might just satisfy your design cravings until we publish our top picks for 2017. Take a peek at what’s hot and how to make it happen a little more affordably. Mixed metals have been making the rounds for the past year or so, but in 2016, we can look forward to seeing metals in high-gloss reflective finishes as opposed to brushed and textured treatments. This glamorous new trend is also dictating less mixing and more favoring of a single hue to highlight. Whether it’s a light fixture, end table or art object, introducing reflective metal instantly raises your glam quotient. 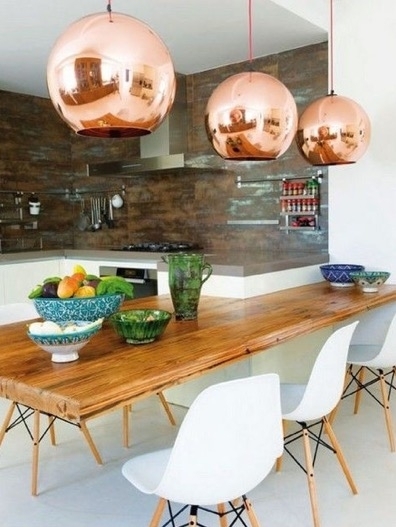 Blush, copper and rose gold shades are especially on point and do wonders for warming up an otherwise stark or cool setting. Achieve this look for less by shopping sites like overstock.com and cb2.com. A little reflective metal goes a long way, so start by incorporating a single pendant lamp or sleek bar cart. Give secondhand and even newly-minted pieces the heirloom look by thoughtfully blending different eras and grouping together decorative items with charming vintage appeal. Whether it’s hand-painted porcelain, crystal bar accessories and decanters, or a collection of needlepoint pillows, this is a trend to have tons of fun with and not take too seriously — even kitschy collectibles can be curated to create a wonderful and whimsical design focal point. Achieve this look for less by sourcing heirloom pieces from vintage shops, online auctions or, better still, from your grandparents’ attic. When original art belies your design budget, look no further than cool graphic textiles and fabrics. Converting an oversized swatch of fabric into wall art is as simple as having it framed and hanging it as if it were a large-scale painting. The best thing about textiles as art is their power to single-handedly pull together a space when the right palette and pattern combo is chosen. The graphic itself — whether tribal, mid-century, floral or ornamental — can set a room’s tone and set precedence for the room’s overall design theme. Achieve this look for less by browsing etsy.com and your local vintage shops that carry upholstery and home furnishings. If you have a knack for framing, you can do-it-yourself and save even more. If you’re a wallpaper fiend like we are, it’s hard to flip through all the mouthwatering swatches without at least considering how they might transform your space. If you’ve shopped for it lately you know how expensive wallpaper can be, but there’s a way to indulge in your must-have designs without covering all four walls. Get creative and think outside of the usual wallpaper applications — we think you’ll find at least a half dozen smaller spaces where you’ll enjoy it just as much. Achieve this look for less by finding smaller areas to hang your wallpaper obsession du jour. You won’t need much and you’ll get the same impact and appreciation out of getting to enjoy it every day. Think the interior of a cabinet, closet or even the risers of a staircase. Tiled bathrooms and kitchens have had a huge revival in recent years. In high-moisture areas, there’s no better way to add texture and visual interest. What’s we find special about the latest trends in tile is the bold geometric patterns, and fresh and unexpected colorways. Even in micro areas, these striking designs have the power to completely transform a room and amp up its personality. Achieve this look for less by earmarking a smaller area in which to mount your tile. Consider centering it just over a sink or stove rather than the full length of your counter. Affordable alternatives such as thermoplastic panels deliver the same graphic impact and are installation-friendly for all you do-it-yourselfers out there. Design forecasters are heralding white as one of the hottest colors to work with this year and Benjamin Moore has named Simply White OC-117 their 2016 Color of the Year. White is complex in its simplicity and not as easy to work with as you might think. A great room to experiment in is a living room and a fresh coat of paint is a relatively inexpensive way to completely overhaul your look. Rethink what you reintroduce into the room once the walls are painted. Keep the palette light and balanced with a few deeper accent colors to disrupt the tonal effect and give the eye a resting place. Achieve this look for less by limiting your new color experiment to one room. We love a white living room or guest bedroom with minimal furnishings and minimal introduction of secondary colors. See more tips for decorating with white here. If you’re interested in introducing any of these great trends into your interior, consider working with a Decorist online interior designer. Starting a design project is as simple as uploading photos of your current space and getting matched with the right Decorist designer that will fit your style and budget. Find out how online interior design works!